29.3.1932 - 27.3.2019 Died peacefully beside her beloved Husband. 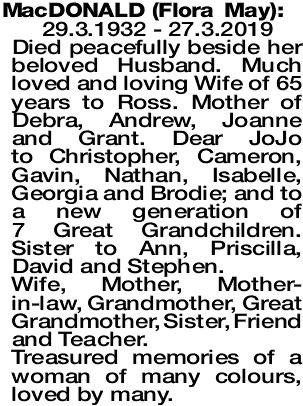 Much loved and loving Wife of 65 years to Ross. Mother of Debra, Andrew, Joanne and Grant. Dear JoJo to Christopher, Cameron, Gavin, Nathan, Isabelle, Georgia and Brodie; and to a new generation of 7 Great Grandchildren. Sister to Ann, Priscilla, David and Stephen. Wife, Mother, Mother- in-law, Grandmother, Great Grandmother, Sister, Friend and Teacher. Treasured memories of a woman of many colours, loved by many. The Funeral Service for the late Mrs Flora May MacDonald, formerly of Innaloo, to be held at the Crematorium West Chapel, PINNAROO Valley Memorial Park Cemetery, Whitfords Ave, Padbury at 2:00pm on THURSDAY (4.4.2019).